A group of Uptown property owners — three families to start, but expected to number in the hundreds as the case grows — filed suit this week against the Sewerage & Water Board of New Orleans, seeking compensation for damage to their homes from proximity to the installation of major new drainage canals along some of Uptown’s largest thoroughfares, their attorney said. The case covers damages to homes along each of the corridors that are part of the ongoing Southeast Louisiana Urban Flood Control Program — Jefferson (which includes a four-block stretch on Prytania Street), Napoleon and Louisiana avenues. Whitaker said his lawsuit is heavily modeled on a similar case from a decade ago (known as the “Holzenthal” case for one of the families involved) after an early SELA project drainage canal was installed in Broadmoor. That concept, Whitaker said, is known as “inverse condemnation” and applies to damages from the current SELA projects exactly the same as it did for the Broadmoor families. The Sewerage & Water Board did not respond to an emailed request Thursday morning to discuss the case. Speaking at the Columns Hotel on Wednesday night, Whitaker said his practice is in Carmel-by-the-Sea, Calif., where he was involved in a major lawsuit against the Los Angeles Metro Rail system over losses to businesses. He has close friends he visits on holidays who live on Jefferson Avenue in New Orleans and as the SELA project progressed, Whitaker decided to become involved on their behalf and for others. Bruno & Bruno Law Firm of New Orleans has agreed to be the local co-counsel on the case, Whitaker said. “They’ve been telling me for the last couple of years about the misery they kept experiencing,” Whitaker said. Whitaker said that the three families named in the petition for damages — the Sewells on Jefferson Avenue, the Fenners of Arabella Street and the Deussings on Prytania — represent the lead plaintiffs in the case, but he will be joining others to it. He has held four town hall-style meetings since March with between 200 and 300 people attending in Uptown locations such as the Jewish Community Center and the Columns Hotel, and estimated that about 100 have signed up to join the lawsuit already. Charles Napoli was among the attendees Wednesday night, and said his father, an 84-year-old resident of Jefferson Avenue since the 1970s, had to move out of his house because, with the driveway blocked for more than two years, he couldn’t manage the several-blocks walk. Now, Napoli, said his own Jefferson Avenue home has suffered catastrophic damage that an engineer has attributed to the vibrations from the project. Although the families represented will all be making the same basic legal argument about the Sewerage and Water Board’s responsibility to compensate them, the case will not be a class-action lawsuit, Whitaker said, because of the “one size fits all” judgments rendered in those cases. Instead, each property owner will seek payment for their own individual cost of damages, he said. Meanwhile, Whitaker is paying the experts he is consulting up front, and his firm will be compensated on a contingency fee only if the case is successful, with costs factored into the individual judgments he seeks. More than 30 people attended the Wednesday night meeting with Whitaker at the Columns, and many of their questions focused on the risks they may face by joining the lawsuit. One woman asked whether — since the Sewerage & Water Board is self-insured on this project — the city will subsequently raise rates to pay for the judgments. The board already has money set aside to pay judgments, Whitaker responded. Further, any judgments paid to homeowners for damages will actually be credited as part of the payments that the Sewerage & Water Board owes to the U.S. Army Corps of Engineers for its share of the project’s overall cost. In that way, the U.S. Army Corps of Engineers is almost serving as an insurer for the Sewerage & Water Board, he said. “It’s not like you’re suing yourself, because you’ve already paid for it,” Whitaker said. As part of the SELA project’s own claims process, government officials sent inspectors to document the conditions at homes along the route. Whitaker said he will obtain those reports as part of the investigation into the case, but that he expects to challenge their validity. One Jefferson Avenue resident said he was trying to refinance his house, and that the appraiser actually reduced the value of his house by “tens of thousands of dollars” — despite the rapid increase in property values elsewhere in Uptown New Orleans — specifically because of the conditions created by the construction. Whitaker said that the diminution of value will be included in the claims. 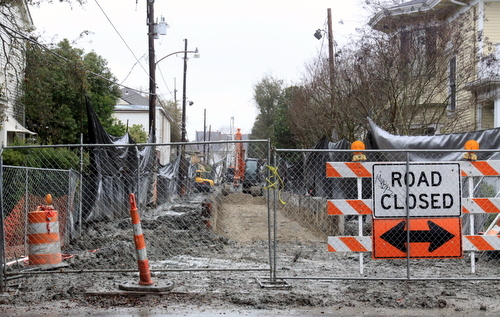 Another resident on Napoleon Avenue asked whether health hazards caused by poor air quality around the construction zones would be part of the lawsuit. Whitaker said he has not begun investigating those issues yet, but would look into them. Whitaker and Bruno filed the initial petition for damages on Monday, and the Sewerage & Water Board has yet to respond, court documents show. At a minimum, Whitaker said he expects the case to take 18 months, likely concluding roughly around the same time as the SELA projects themselves. If you damage something you have to pay for it. I’ve seen the foundation damage being caused by the work they’re doing, and it’s not insignificant. Even properties blocks away have been impacted. These strike me as legitimate suits. Obviously, you do not live in the impacted area. I do! We have been put out of our driveways for months, and even worse, because of all the cement silos, high-pressure pumps, generators, backhoes, etc., we are totally fubared if a fire breaks out, or a medical emergency occurs, because they can’t get anywhere near us! The fire hydrant that services two blocks has been commandeered by the contractors, so there’s nothing to hook up to anyway. I challenge you to live under these conditions, no matter what your income level is, and tell me that you wouldn’t be fed up! Btw, I’m not one of the plaintiffs, yet………. You’d think different if it were you’re house, too. Inverse condemnation sounds like a brilliant solution to loss of property value. Now what happens after the SELA project is done – would these same houses increase in value as a result of reduced flooding, lower flood insurance rates. Would that factor into the overall settlement, if any? It’s not so much loss of property value as it is actual damage. The city could simply pay to restore the homes to the condition they were in before the they were damaged and adequately compensate homeowners. And the homeowners will be called upon to prove their damages and the attorney’s fees will come out of their award, so there won’t be a windfall. Isn’t there a non-litigious process for making a claim for damage to your property caused by such projects? You can ask nicely without suing. Nowadays, the judge will make you negotiate a settlement anyway. The Sewage & Waterboard contracted outside forensic engineers to handle the claims with regards to the current projects. The owner gets paid if their claim is legitimate. When they dug 5 feet from my front yard 20 feet below the street surfce and I reported them because my windows were crashing to the ground and walls cracking not knowing at the time my sewage had backed up all on my vacant first floor as so did my neighbors attorney mark maurices, I complained to them and the city and I was getting no where but tired and depressed. Im glad that someone is picking up the torch. Im getting old and to tired to fight. Its sad that people want to be haters and not take responsibility for their actions that victimize hard working people like myself that come from nothing. I am a home owner on South Claiborne Avenue near Carrollton who has been impacted by these repairs. I have been waiting to act until the construction moved across Carrollton, which it has now. Who do I contact to make a claim without going to a law firm or involving myself in a group lawsuit?